The international support for Cuban political prisoners Sara Martha Fonseca and her husband Julio Ignacio Leon is certainly important and much appreciated by their family and supporters on the island. But what is truly impressive is how the couple's plight since their arrest on Sept. 24 has inspired their fellow activists to literally go to the Cuban street to demand their release. Family members and activists this week launched a campaign dubbed "Freedom for an innocent couple," on behalf of Fonseca and Leon, who were beaten and arrested during a demonstration in Havana. During a jailhouse visit last week, one of her sons found Fonseca to be in poor health, still suffering from beatings she received to her back and other parts of her body and from a hunger strike she started to protest her arrest. On Thursday, she drank some liquid for the first time, but as of Saturday night, Oct. 1, she remained on hunger strike. Meanwhile, her husband has been admitted to a military hospital in Havana after he started his own hunger strike. The couple's sons are taking the lead in generating support for their parents. The nascent campaign already has included the distribution of about 300 fliers in Havana. “Sara Marta Fonseca and Julio Ignacio León ... are innocent," the flier reads. "We will take this campaign nationally and internationally to demand their freedom," said Julio León Fonseca, a hip-hop singer. "We ask for the solidarity of anyone who loves freedom of expression." The couple are just two of dozens of Cuban opposition activists arrested since last weekend. Other well known dissidents arrested include Yris Perez Aguilera of the Rosa Parks Feminist Movement and Eriberto Liranza, leader of the Cuban Youth Movement for Democracy. It is difficult to keep track of who exactly been arrested, released, etc., but where you can help is to spread the news about what is happening, even if it's only to repeat their names and to demand their release. It really does make a difference. And it will deliver a blow to a regime that relies on the world community's ignorance and indifference in order to get away with their repression. 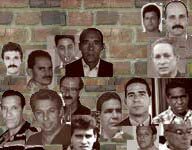 Cubans like Fonseca and Leon are in jail because they refuse to stay silent while the Castro regime drags Cuba further into its hell. Following their example, neither should we. UPDATED, Oct. 8, 2011 -- The couple were released from jail on Oct. 7, 2011.